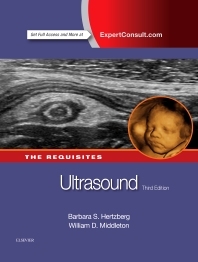 This bestselling volume in The Requisites™ Series provides a comprehensive introduction to timely ultrasound concepts, ensuring quick access to all the essential tools for the effective practice of ultrasonography. Comprehensive yet concise, Ultrasound covers everything from basic principles to advanced state-of-the-art techniques. This title perfectly fulfills the career-long learning, maintenance of competence, reference, and review needs of residents, fellows, and practicing physicians. Covers the spectrum of ultrasound use for general, vascular, obstetric, and gynecologic imaging. Fully illustrated design includes numerous side-by-side correlative images. Written at a level ideal for residents seeking an understanding of the basics, or for practitioners interested in lifelong learning and maintenance of competence. Extensive boxes and tables highlight differential diagnoses and summarize findings. "Key Features" boxes offer a review of key information at the end of each chapter.